Forge, 2005 (hardcover, out of print); Kindle, 2011; Nook, 2011; Sony Reader, 2011; Kobo, 2011, and Apple iBook, 2011 (all $3.99 ebooks). Now in Large Print, 2015 ($15.98). 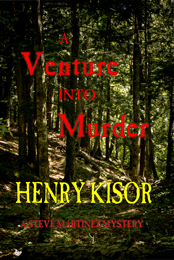 A Venture into Murder, Henry Kisor’s second mystery featuring Deputy Steve Martinez, returns to Porcupine County, nestled into the deceptively peaceful landscape of Michigan’s Upper Peninsula. Its seat is a small town where the residents all know one another, and the latest gossip is never something that can be kept quiet for long. But there’s one secret that Porcupine County has tried to keep quiet for years . . . and those who try to uncover it sometimes wind up dead. Steve—Lakota Sioux by birth, white by upbringing—fell in love with the town after running away from a secret of his own. After finding the love of his life, Steve was able to make peace with his past and find comfort in the land that had been so good to his people. The quiet is broken, however, after the discovery of the body of a mob hit man. Then, during a routine operation, one of Steve’s men stumbles over the long-buried corpse of one of Porcupine County’s missing . . . a man who was last seen a century ago. The two deaths are seemingly unrelated at first . . . but Steve Martinez isn’t one to let a matter of relation stop him. As Steve probes deeper, he’s confronted with problems both professional and personal that could jeopardize everything: his career and his relationship with the beautiful Ginny Fitzgerald—a wealthy widow with quite a few secrets of her own. Through shoot-outs and death-defying surveillance flights, Deputy Steve Martinez is willing to do whatever it takes to keep the peace in the land he loves, but he may find that—even in the quietest of towns—there are some things that are better left buried.